Have you ever been so close you can taste it? Well, that is where I am at. I’m so close to finishing my reupholstering project of this old channel back chair that I can taste it. But there’s still some major elements that need to be done. And one of them is today’s post. The last two visible elements to the front of this channel back chair are the arm inserts and the front band with welt cord. When I first decided to recreate this channel back chair, fabric was a natural jumping off point. And I got super lucky with a rich taupe velvet mixed with gold flecks in a donated fabric to our upholstery class. The only down part was there was not enough for the whole chair. In truth I was okay with that because I wanted the living room, the room the chair was going in, to be vibrant, full of energy and lively with color. After a long, and I do mean long search, I found the most amazing white linen fabric print that looked like someone had fun drawing with those thin Crayola markers. It was awesome. It just didn’t quite go with the beige fabric. I needed a blending fabric. By sheer lucky, I was sorting through the clearance rack at JoAnn’s and found this tone on tone white leopard print with gold flecks. The perfect bridge fabric! The leopard print’s white color with gold accents blended the white background of the print with that of the gold flecks in the taupe fabric of the chair. As you have seen, the taupe became the inner fabric, the leopard print is going to be the welt cords and the fun print – the back, front band and arm inserts. Adding the front band is the first time that I saw my vision starting to come together. No joke. My husband has literally questioned the fabric choices, the finishes and final touches of every element going into our living room, including this channel back chair remodel. I have enjoyed the whole process but making intricate design choices makes it that much more fun! And that’s where this starts, with a design decision. First, I took my printed fabric and decided what I wanted to highlight from the print and exactly where I wanted to place it. In this case, I chose a blue flower to be the center partially because the long stem marked the center with a fun line and because of the bird to the left of it. I thought it really played up the whimsical element of both the fabric and the feel of the living room. I used the existing front band from the original chair as the pattern to cut out the new front band. Second, came the welt cord. If you’ll remember from the deconstruction stage, I was keeping everything. In the case of this channel back chair, it had a plastic welt cord. Now, it has a wonderful advantage in that it helps keep the welt cord stiff. If not, a traditional fabric welt cord works too. The other advantage of keeping the original welt cord was I had a premeasured pattern. It then was a simple matter of cutting a 1 and 1/2 inch band of the leopard print at a length the same as the original welt cord. Here is where you need to know how to sew. Using a welt cord foot, sew the welt cord into the fabric by folding the fabric over the cord and in half – evenly on each side. The key is getting as close as possible to the welt cord. Then sew the patterned fabric front band to the welt cord making sure that the center of the welt cord is also at the center of the blue flower, again sewing a half inch seam of the printed fabric at the seam of the welt cord and printed fabric. I so hope that made sense but basically you want the welt cord attached to the front band. Thankfully attaching the front fabric band was not too difficult. Pin the front band to the chair making sure that the band is in the place where you want it. To keep it stable, I pinned from the center out on a straight horizontal. Next, I flipped the fabric up, stapling horizontally as I went along. In order to keep the welt cord stiff and in place, I placed a cardboard strip as close as possible under the welt cord. To give it the most stability, stapling at an angle. Because the arm inserts must go under the front band, I needed to leave the edges open and unstapled. Half-inch tuft is next, which allows for soft but solid firm foundation for the front brand. Plush but stiff. To do, it was a simple matter of cutting tuft to the size of the front band. Split the edges for stapling. Push the tuft as close as possible under the welt cord and attach the tuft to the chair by stapling the top tuft edge, again leaving the ends open. Cut the tuft bottom to the shape of the bottom of the chair. Staple it in place. To make the arm inserts, I took the inserts from the original chair and used those as the pattern for the new arm inserts. To make the inserts, I first determined what wanted to highlight from my patterned fabric. I looked for a location where both insert were fairly identically match and had symmetry. In order to use the least amount of fabric and have a different image than the front, I found these color flowers with a round center. It will be perfectly highlight in the center of the arm at the curve. Then it was a simple matter of cutting them out. In order to attach the inserts, half-inch tuft is cut to the size of the inserts on the arm. 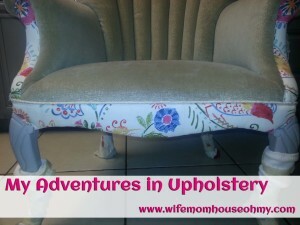 I wrapped the fabric around the top of the tuft, making relief cuts and stapling it to the chair. 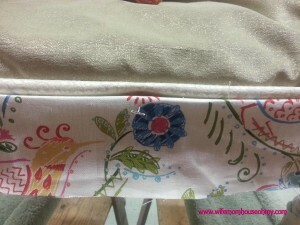 Instead of wrapping the fabric around the outside edge of the tuft, I pulled the fabric around the outside edge of the chair so that it went around the frame and stapled it in place. Next, I pulled the bottom piece of fabric chair inserts underneath the welt cord of the front band. I then finished stapling the front band top to the chair frame. Making sure to pull it tight and continuously smooth the front band as I went, I stapled it on the bottom underneath the chair frame. The key to keeping it pulled tight and smooth was to staple each staple on the horizontal and very close to each other. The last part to the front band and arm inserts is to pull the side of the front band around the edge of the frame and staple them in place. As I said, so close I can taste it. Only items left – back, bottom and finishing details.